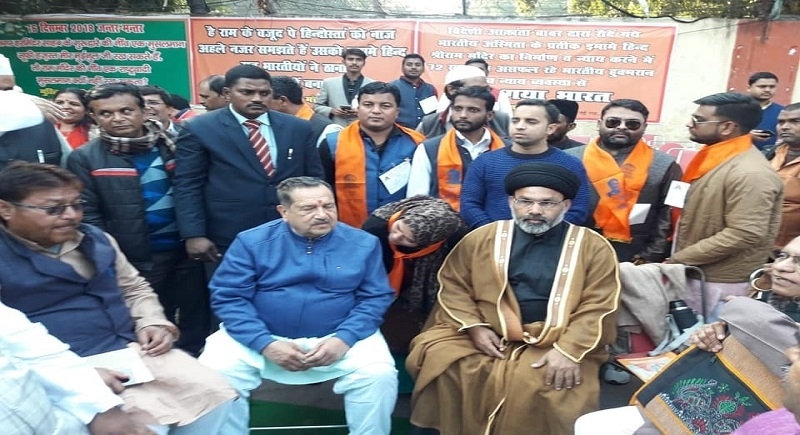 New Delhi, Dec 17: Making it a historic event in post-independent India, Muslims from all states gathered at Jantar-Mantar in New Delhi on Sunday to take the vow to support the construction of a temple for Sri Ram at his birthplace in Ayodhya. This has happened under the initiative of Muslim Rashtriya Manch (MRM), a social reform movement working among the Muslim Masses since 2002 under the patronage and guidance of Indresh Kumar, a senior RSS functionary. The Muslims men and women, old and young came in groups and teams waving the national tricolour at Jantar-Mantar shouting slogans like "Hindustan ke Musalmaan ne ab thana hain, Imam-E-Hind Sri Ram ka Mandir vahin banana hain; jhagda sada-sada ke liye khatm karna hain, tarakki, talim, bhaicharewala Hindustan banana hain". They came in thousands representing all the states of India and more than 250 districts braving the chilling cold of the national capital on the Sunday Morning. Besides Indresh Kumar, Muslim intellectuals and religious scholars like leading Shis scholar Maulana Kaukab Mujtaba, Maulana Suhaib Qasmi, Press Council Member Raza Rizvi, Dr Shahid Akhtar, Dr Majid Ahmed Talikoti, Mohd Afzal, Abu Bakar Naqvi, Shahnaz Afzal, Adv Shaheen Parvez and others. The speakers who addressed the gathering maintained that the mosque was built there by destroying the Ram Temple. Hence, according to Islam, this cannot be considered as Mosque and namaz offered there would not be accepted by the Allah. It is wrong to use this point to indulge in politics on this issue. The MRM has appealed to all the political parties to stop deriving political benefits out of this and think seriously on constructing Ram temple there. A memorandum was also submitted to the President, Prime Minister, Law Minister, Chief Justice of India and Law Minister seeking early solution to the matter. 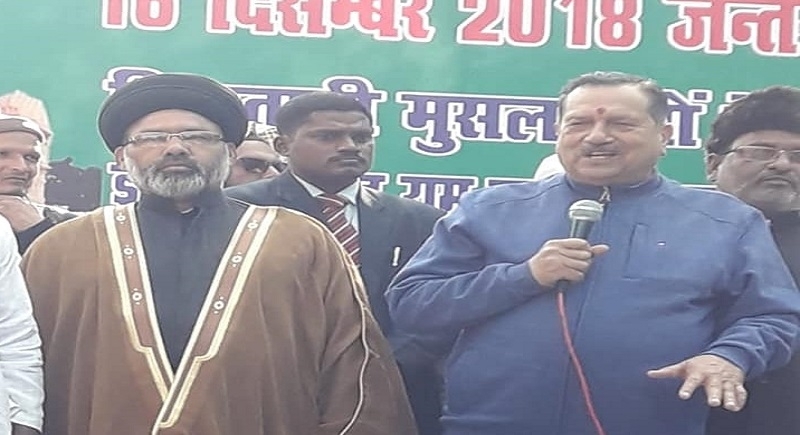 Addressing the gathering Indresh Kumar, MRM Patron and guide, said that it was wrong to perceive that each and every Muslim in India is opposed to building a grant temple of Lord Ram. On the contrary, he said that the common Muslim has supported the idea of Ram Temple. They consider Sri Rama as 'Imam-E-Hind'. The famous poet Allama Iqbal, who, before migrating to Pakistan, wrote the famous poem "Saare Jahan se achha..." gllorified Sri Rama as "Imam-E-Hind". 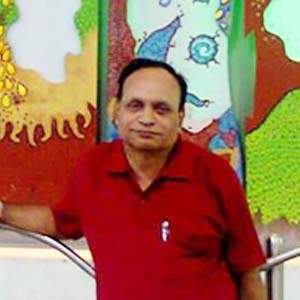 He wrote: "Hain Ram ke vajud pe Hindostan ko naaz,ahle najar samajhte hain usko imame Hind." The holy Quran also mentions the fact about 1.24 nabis being sent by the Allah to different lands, different human races and at different times and that Mohammad was the last prophet. Quran mentions the names of some 20-25 such nabis and the Prophet too has accepted this fact before 1400 years. Sri Ram was also one among those nabis whose birth place is Ayodhya. Indresh Kumar said that if places like Mecca and Kaaba, Vatican City, Golden Temple at Amritsar, Bodhgaya temple are not touched or disturbed lest their purity and sacredness gets polluted, why not same yardstick be applied for Ram Janm Sthan at Ayodhya? Mughal invader Babur and his chieftain Meer Banki destroyed the temple in 1526 and built a mosque upon that place and named it after the invader. The Muslims in India has no relations with Babur and Mir Banki. Shia Maulana Kaukab Mujtba in his address said that Hindustani Muslims have no relations with invader Babur and his chieftain Meer Banki. Prominent among those present at the meeting included Maulana Suhaib Qasmi,Maouana Kaukab Mijtaba, Raja RIzvi, Prof Dr Shahid AKhtar, Mohad Afzal, Nazir Mir J & K), Khurshd Rajaka (Haryana), Adv Yasir Jlani, Prof Dr Akeel Ahmed, Jaheer Qureshi Gujarat, Ali Daruwala Maha, Abu Bakar Naqvi Raj, Altamas Bihari, and others.